One of Social Security’s main objectives is to provide retirement support for Americans who pay into the system during their working years. The amount of your benefits may be affected by a range of factors, including your level of earnings and marital status. One key decision to make is when to start receiving benefits, as the amount you receive increases from age 62 to 70. 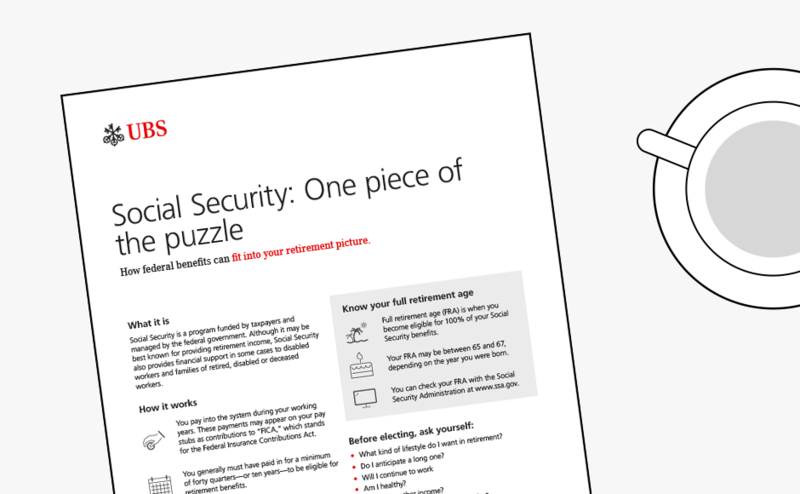 Social Security is intended to be one piece of your retirement planning puzzle but not the whole picture. Infoline: What you need to know about the program. Description: Social Security is a federal program that provides monthly income to older Americans, disabled workers and some dependents. When it comes to Social Security retirement benefits, it’s important to understand how they work and why the decision of when to claim benefits matters. 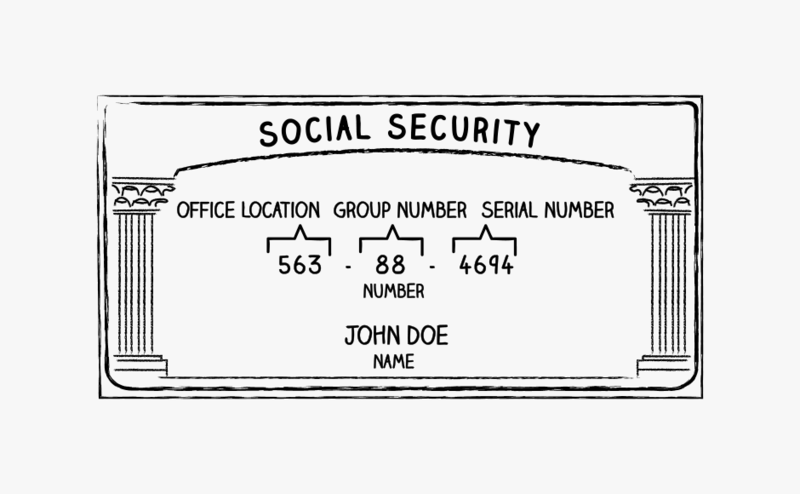 Keyline: How well do you know Social Security? Infoline: Decisions you make now can have an impact down the road. Description: Although you can’t control how your Social Security benefits are calculated, it’s important to understand what to expect from the program and how it fits into your overall financial picture. Note: If you cannot view the video (due to a firewall), please use your mobile browser. Keyline: Keep working or retire? Infoline: Why Social Security benefits should factor into your decision. There are three important ages to keep in mind as you determine when to retire and when to start receiving Social Security: 62, Full Retirement Age (FRA) and 70. Your FRA is the age at which you become eligible to receive 100% of your Social Security benefits and may be between 65 and 67, depending on the year you were born. 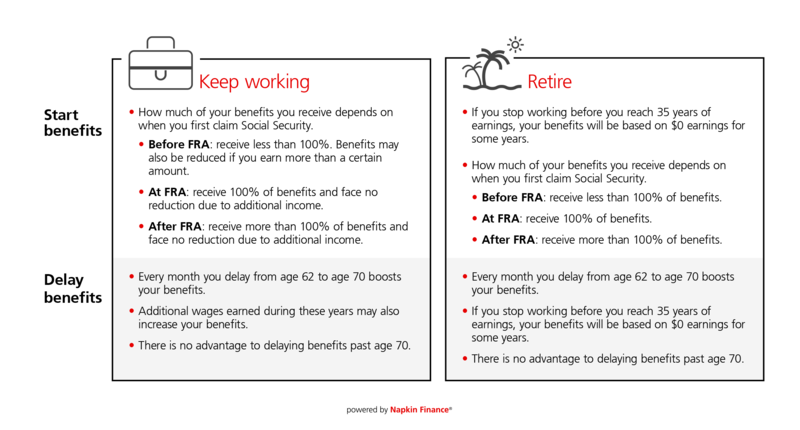 If you start receiving benefits before your FRA, you will receive less. If you delay claiming until after your FRA, you will generally receive more than 100% of your benefits. If you choose to delay, continuing to work may also boost the earnings level that is used for calculating your benefits. Description: The decisions of when to retire and when to start receiving Social Security are complex. Some people may even choose to start receiving benefits before they retire or delay claiming for years after they retire. The right decision for you may depend on your projected Social Security benefits, your other assets and income and your personal preferences, among other factors. 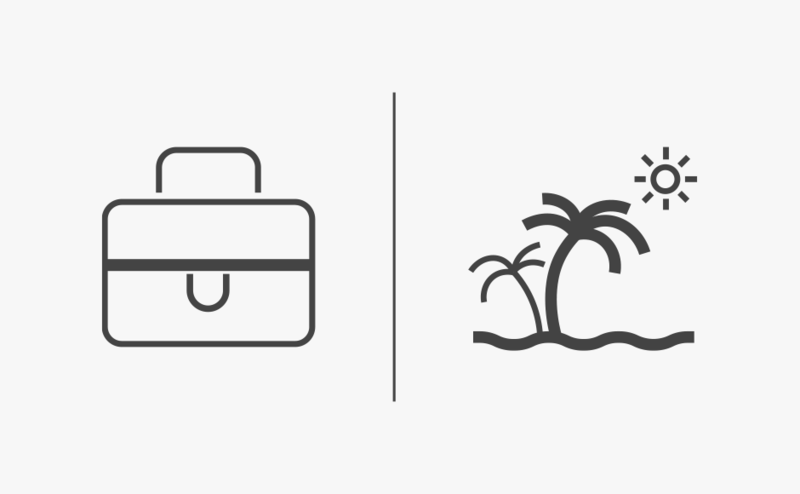 Infoline: The similarities and differences of these two vital programs. Social Security and Medicare are two important federal programs that help support seniors and the disabled. Social Security is a government program that provides financial support. Your Social Security retirement benefits are based on a formula that considers your earnings during your 35 highest-paid years, the date you start receiving income and other factors. Medicare is a federal program that provides health insurance. Your Medicare benefits and how much you pay toward your healthcare may depend on your income and the type of Medicare plan(s) you choose to participate in. Although both programs can help older and disabled workers meet their expenses, they are generally not intended to provide comprehensive income or coverage. Description: Social Security and Medicare are two federally managed programs that may provide important economic support to you in your older years or if you become disabled. 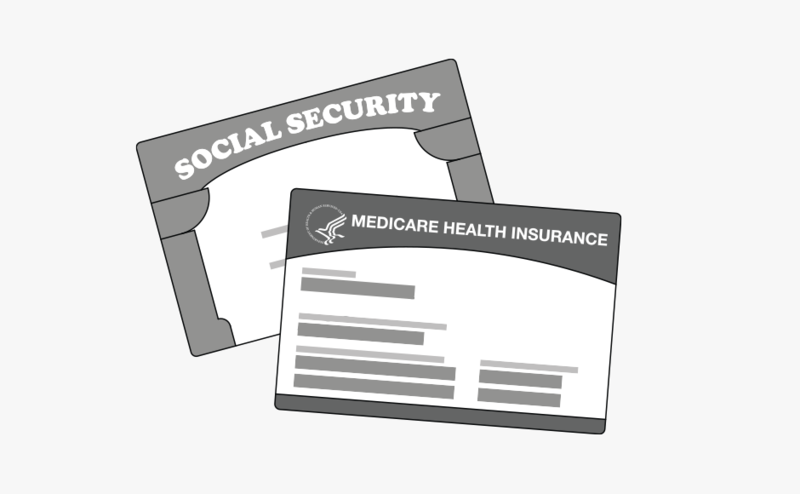 Social Security provides a stream of monthly income to eligible recipients, while Medicare is a government-managed health insurance program. 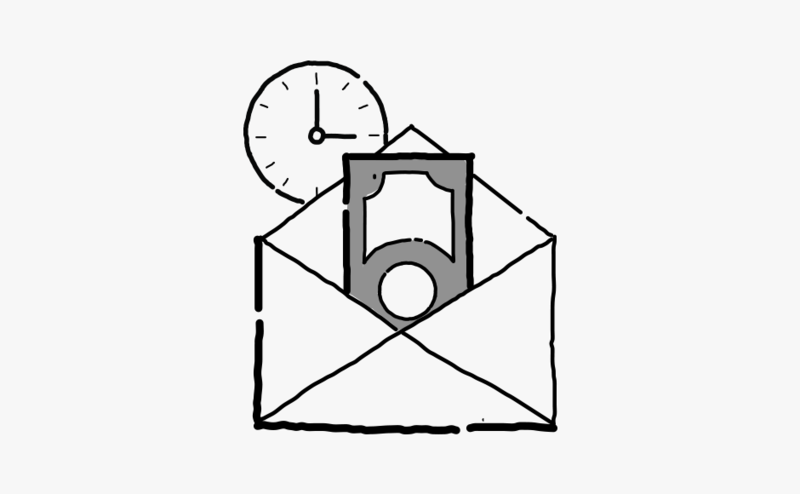 Infoline: How federal benefits can fit into your retirement picture. Description: Social Security can provide valuable financial support during retirement, but it is not intended to replace the role of your retirement savings or pension. It’s important to understand how the decision of when to claim benefits can impact the monthly amount you receive.